Wine Fairy for Wendy’s Birthday! May Your Glass be Always Full of Fun Wendy! Wendy is off celebrating her birthday on a sunny, golden beach today so we celebrated her birthday with her Wine Fairy before she left this week. As Wendy is my blogging guru, the co-founder of this blog, a great friend & a passionate lover of my cupcakes (and was hinting for most of 2013 that she hadn’t had a birthday fairy yet), I thought that I would surprise her with her own special fairy. My inspiration came from Wendy’s love of wine and her love of red and black and I thought what better way than to have her sitting in her own wine glass! Wendy’s wine fairy even has the same black pants with the ruffled bottoms that we love seeing her wear and I think I have captured her mischievous face and funky hair style too. 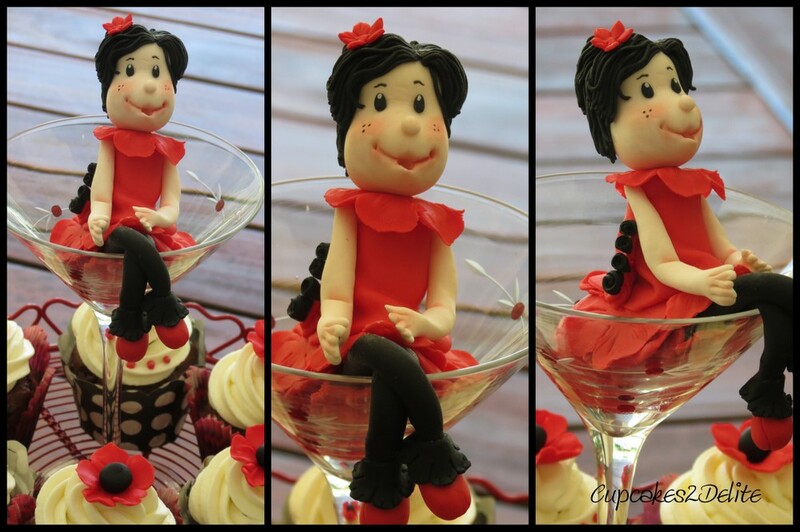 Her matching cupcakes completed the red and black colour scheme for the celebration. Have fun today Wendy knowing that you finally have your own fairy and that she is sitting looking pretty in her own glass. ← In Loving Memory of Teresa. Thanks my dear friend! I had a stunning day down in sunny Plett. I must say though that my birthday was made very special this year due to my ‘mini-me’. She is totally divine and I just love her to bits. She is sitting proudly in her wine glass in my kitchen for all to see, The accompanying cupcakes were (as always) fabulous! Love you to bits special friend! You are most welcome Wendy and glad you haven’t turfed her out yet to use the glass…only kidding! Have fun with her watching your every move in your kitchen!